The mechanized harvest involves harvesting the grapes along the rows of the plant with a special machine that with its action detaches the grapes by conveying them to appropriate containers at the edge of the same. All the machines on the market expect to carry out this operation by acting uniformly on the entire row, thus collecting all the grapes present. 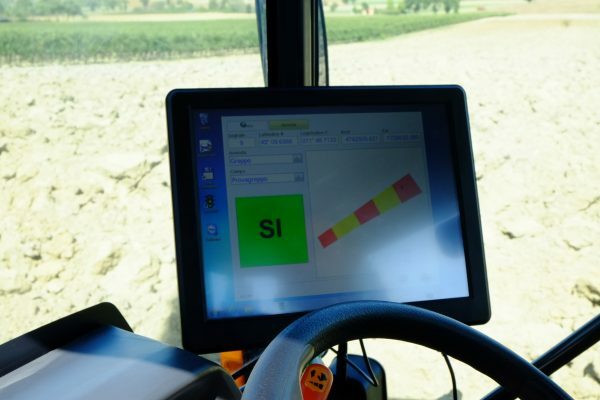 The modern technologies of near and remote detection make it possible to identify parts of the same vineyard where it is believed that for reasons linked to the nature of the soil or other causes, the ripeness of the grapes can be anticipated compared to other areas. The quality that is obtained by harvesting in a single solution is not an average between the major and the lowest quality, but tends to vice versa and unfortunately to approach the latter as defects mark more than the merits. There is already a patent for which the grapes belonging to the classes of minor force can be conveyed into one of the two containers on board the machine while the grapes coming from areas with high vigor (which normally carry more quantities of grapes with delayed maturity) go in the other. This allows for a differentiation into two classes of the harvested grapes which will then be vinified separately on two different lines in the cellar. Our patent vice versa provides that the machine in its passage can be operated intermittently rather than continuously, by exerting the action of the shaking and collecting elements only in the affected area on the basis of the presence of grapes within it having the desired maturity characteristics, leaving vice versa on board the plants the grapes still unripe or of undesirable quality. This can be collected in one or more successive steps according to the desired oenological needs. 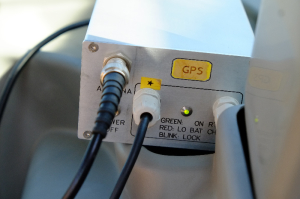 To allow the operator to operate the shaking members in the pre-set areas, an automatic system can be used to when a GPS antenna is placed on the machine which determines the actual coordinate, this data is compared to a map already prepared for this purpose and the system interacts with the shaker control elements. The preferred system would however be that on existing machines a terminal is installed that allows to give indication to the operator to guide the grape harvester to know at that moment whether he or she must collect the ignition of a large green square or stop at the switching on the red (traffic light). There is also an automatic switching on and off version.